Today at a Homeland Security and Governmental Affairs subcommittee on Regulatory Affairs and Federal Management hearing entitled, “Examining the Use of Agency Regulatory Guidance,” U.S. Senator Joni Ernst (R-IA) expressed concerns raised by Iowans over the Department of Labor’s Occupational Safety and Health Administration’s (OSHA) recently issued guidance that negatively impacts anhydrous ammonia retailers in Iowa. Senator Ernst has heard from many Iowans that this guidance is overreaching and economically burdensome, as it would impact the majority of traditional farmer co-ops in Iowa. Witnesses on the panel included Ms. Michelle Sager, Director of Strategic Issues at the U.S. Government Accountability Office; Ms. Mary Beth Maxwell, Principal Deputy Assistant Secretary for Policy at the U.S. Department of Labor; and Ms. Amy McIntosh, Deputy Assistant Secretary Delegated Duties of Assistant Secretary at the U.S. Department of Education. OSHA’s guidance entitled, Process Safety Management of Highly Hazardous Chemicals and Application of the Retail Exemption, would require more paperwork and increase compliance costs for each anhydrous ammonia retail site, which are the majority of farm co-ops in Iowa. Iowa retailers sell over a half a million tons of anhydrous ammonia to farmers each year, from nearly 800 locations across the state. Retailers estimate the cost for compliance up to $25,000 per site which could push smaller retailers out of business. Ultimately, OSHA’s guidance will impact the cost of this widely used crop nutrient for Iowa farmers. 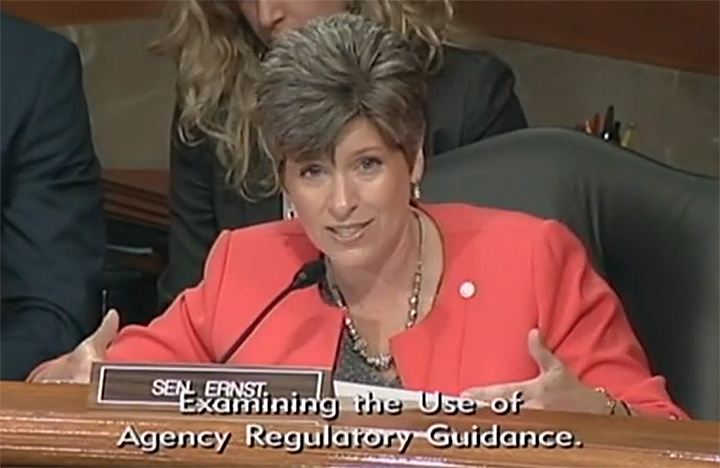 Senator Ernst pressed Mary Beth Maxwell on the Department’s decision to issue guidance in lieu of a formal rulemaking process, a choice that bypasses the ability for key stakeholders like Iowa’s farmers, retailers and co-ops to submit comments. “Is it possible to go back and have OSHA go through the proper rulemaking process so that it is enforceable? If we are truly trying to correct a problem, then why don’t we go through the rulemaking process and make sure that we understand what it takes to go into compliance, open that up for public comment and review,” the Senator questioned. Scroll down to see the video. The article continues afterward. Scroll downto see the video. The article continues afterward.